Although it has many of the signature trademarks that characterize a W Hotel, such as the luxurious goose down bedding and Bliss bath amenities, W San Francisco is still quite unique. 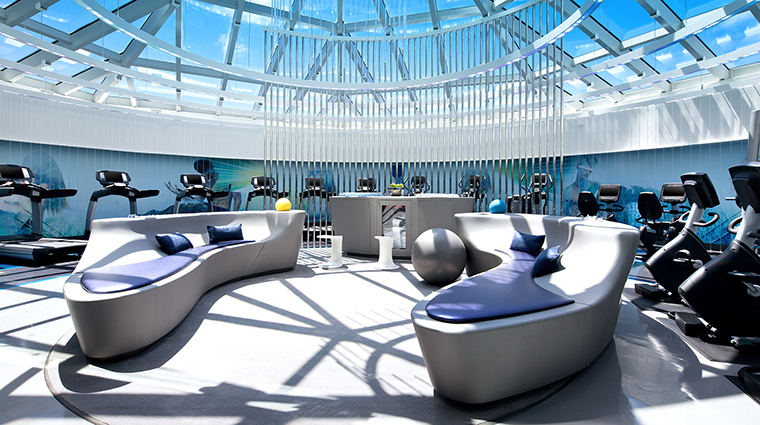 It’s the first W to install a state-of-the-art fitness center, a dynamic circular-shaped space filled with cardio, Pilates and strength-training equipment. It was also first to implement a keyless room entry system that allows you to use smartphones or Apple watches to gain access to your accommodations. 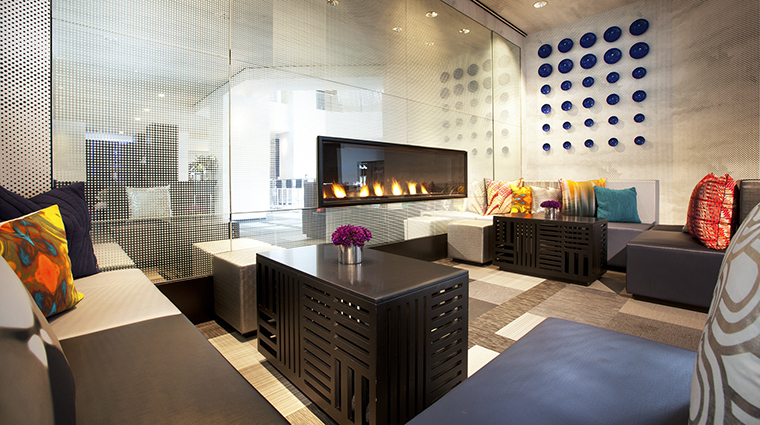 The lobby and ground-floor living room reflect the city’s grid-like design, with black-and-gray-paneled walls, plush gray couches with brightly colored accent pillows. It also has a massive LED display of San Francisco that serves as a backdrop to the stylish check-in desks. There’s also mood lighting, music and special details like floor mats that spell out specific greetings (good morning, good afternoon or good evening) that are changed throughout the day. 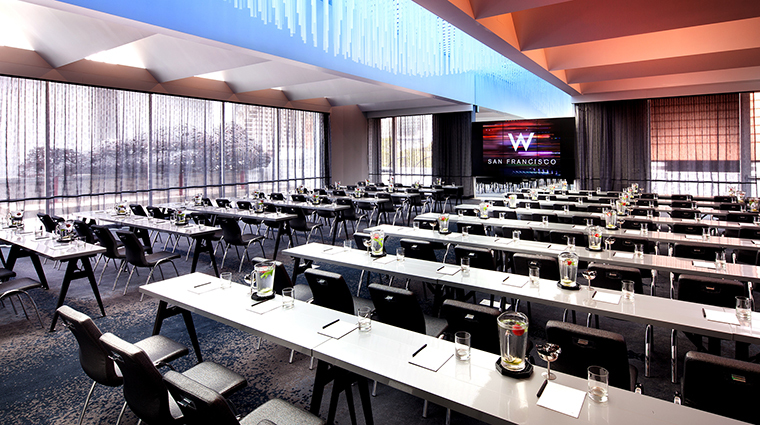 Located directly next door to the San Francisco Museum of Modern Art and a short walk away from the Moscone Center, the W is business-oriented yet trendy, artistic and fashionable. 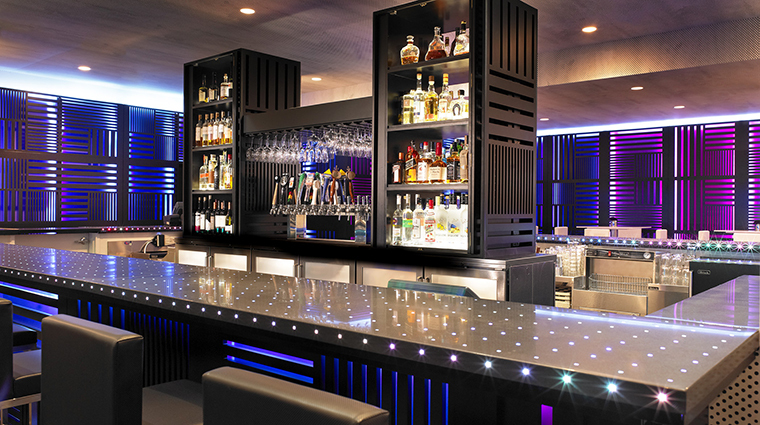 Everything about the hotel feels cutting-edge, from the Lumina light sculpture, an eye-catching 27-foot handcrafted piece that looks like cosmic star clouds and hangs from the lobby ceiling. The progressive hotel hosts programs like What She Said, a series of conversations devoted to addressing women’s issues in the workplace. The fourth-floor Bliss San Francisco Spa — a must-visit for facial services — is a spacious 5,000-square-foot facility with lounges and outdoor spaces. While it’s easy to build a green hotel from scratch, it’s a much more challenging feat to transform an existing high-rise into a sustainable property — but the San Francisco hotel has spent the past five years doing just that. The tasteful hotel is the seventh existing hotel in the nation to receive the LEED-EB Silver certification, a title allotted to only the most green hotels in the world. The W uses energy-efficient electronics, lighting and climate control, reduces carbon emissions and practices extreme water conservation. Eighty-three percent of the hotel’s total waste is recycled or composted, and the liquids from unused bath amenities are recycled and repurposed, too. Check-in and checkout is paperless. Valet parking is discounted for those driving hybrid vehicles. The roof doubles as a bee haven with more than 10 beehives producing honey used by the culinary staff. The 31-floor hotel holds 404 guest rooms, many with stunning views of the city skyline, the Bay Bridge, and the shimmering sea. The rooms are artfully arranged with low-slung king beds anchored with dark wooden headboards. Mirrors cutout in flourishes and swirls adorn the walls and rooms have a soothing gray color palette. Furniture is polished white or painted black; accents of turquoise, lime green and fuchsia dot the room. Corner accommodations also have a welcoming lounge area with loveseat couches and sophisticated white glass-top desks. The generous bathrooms have a subtle Asian influence with glass sinks engraved with swimming koi, shower heads with excellent water pressure and an assortment of Bliss body and facial products. 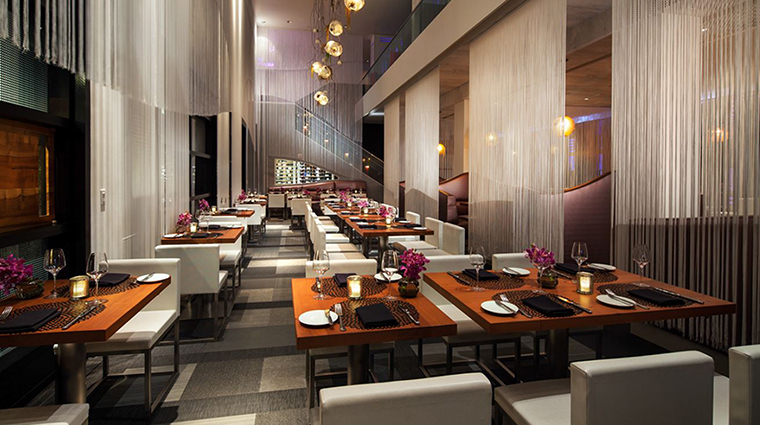 Even the trendy hotel’s dining concepts are in on the green movement. The ground floor’s restaurant, Trace, helmed by chef Jason Rea, creates menus based on seasonal availability of local ingredients — all of the organic and sustainable products featured can be traced to a nearby farmer or artisan. The gorgeous dining room is decorated with shiny purple leather booths, white fringe curtains that hang from the ceiling and wooden accents. There is a hint of ’70s-mod to the space, and yet it feels very now, if not a little futuristic. Menu items include a vegetable tartine with house-made farmer's cheese, asparagus, radish and English peas; broiled king salmon with black bean glaze, basil and parsnip; and a black trumpet mushroom blintz with cauliflower, Swiss chard, baby carrots and preserved lemon. Chef Rea also oversees the menus at the Living Room and Upstairs, which both serve up fennel sausage flatbread with mornay, fingerling potatoes, rosemary and chili oil; scrumptious house-made potato chips with dill ranch; and ginger pork skewers with the rooftop honey and sesame.